Heart and Sole: A day hiker's guide to Success Pond Rd. My body said "Take a day off". I had been losing weight despite eating all I could - just burning too many calories with all the mountains the trail goes over - all the ten hour days of constant exertion. Besides, the weather was giving me a bit of an excuse - forecast was for a "60% chance of showers and thunderstorms, mainly between 2 and 3PM"
Seriously? That was an NWS computer-generated forecast. No Way! Who forecasts weather with that much accuracy, down to the exact hour? - No Way! It can't be done. Must be a computer glitch. The morning was sunny, warm to hot, and humid. I slept late and then headed out to do some serious scouting. 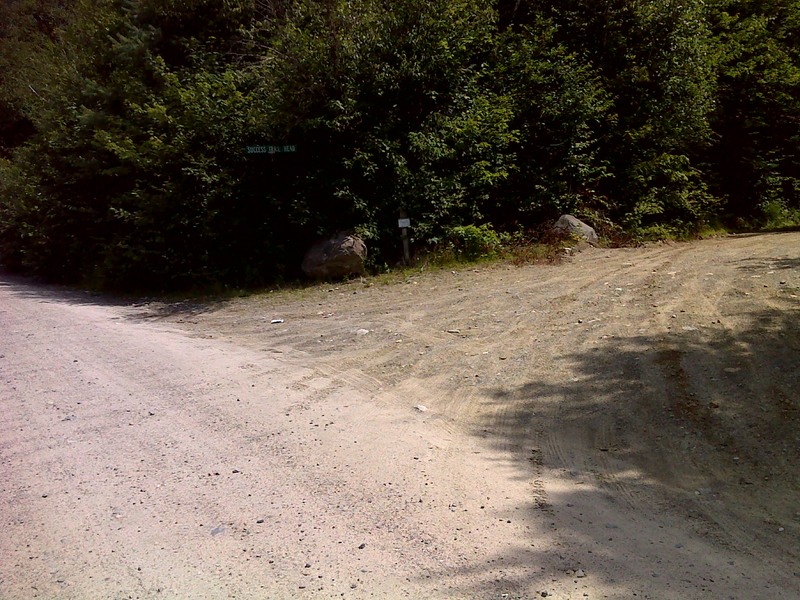 The 30.9 mile section of trail through the Mahoosuc Range between Gorham and Grafton Notch has no road crossings. 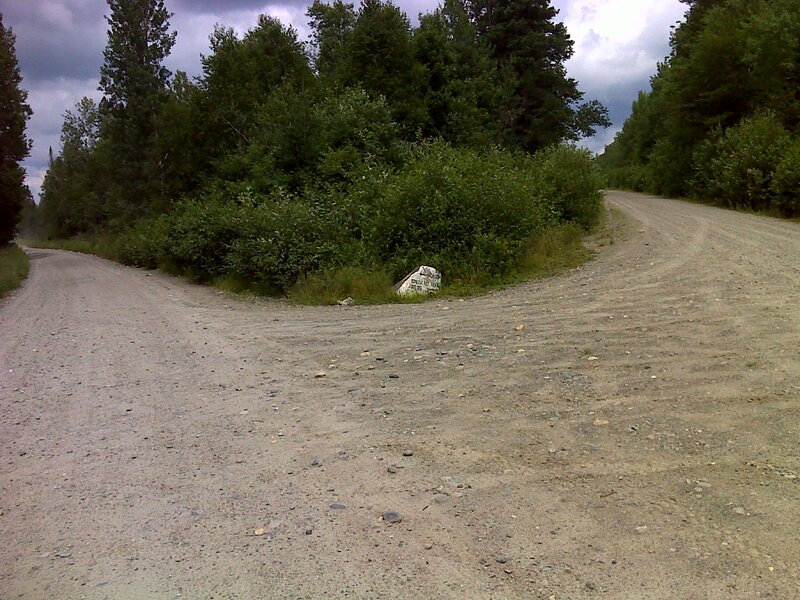 But it is paralleled by Success Pond Road (a main-haul logging road that has been notoriously difficult to find and navigate, according to the AMC guidebook), and there are four vital trailheads along that road, each of which lead up to the AT after 2-4 miles of hiking. My mission: become familiar with this road. It will be my lifeline to the AT for the coming week. Well, the guidebook says it has become easier to find and navigate lately. I'd have to agree. 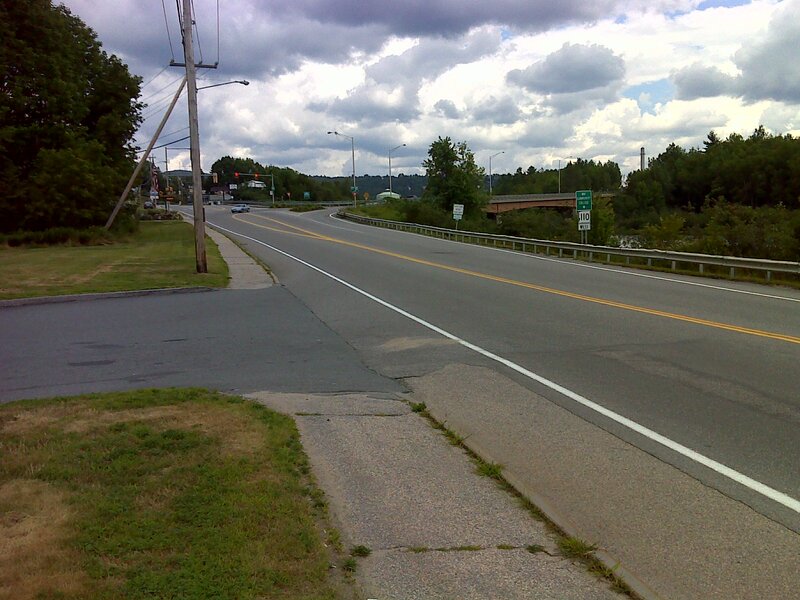 First of all, the guidebook says drive north on NH 16 (from where US 2 west [the guidebook says 'east'] forks off to the left) and take a right off NH 16 onto Union Street and cross the Cleveland Bridge. I saw no sign naming the street nor the bridge. But it's a major intersection with a light. The right fork that crosses the bridge is called NH Truck-16 and it's a truck bypass around the town of Berlin. It's well marked and you'd have to be seriously distracted to miss it. Now ... just stay on Truck-16 for 1.8 miles and you come to a nice, easy-to-see sign on the left side of the highway pointing to the right. There's a nice, well-defined road there leading uphill to the right, and that's Success Pond Road. Set your trip odometer to zero and go. 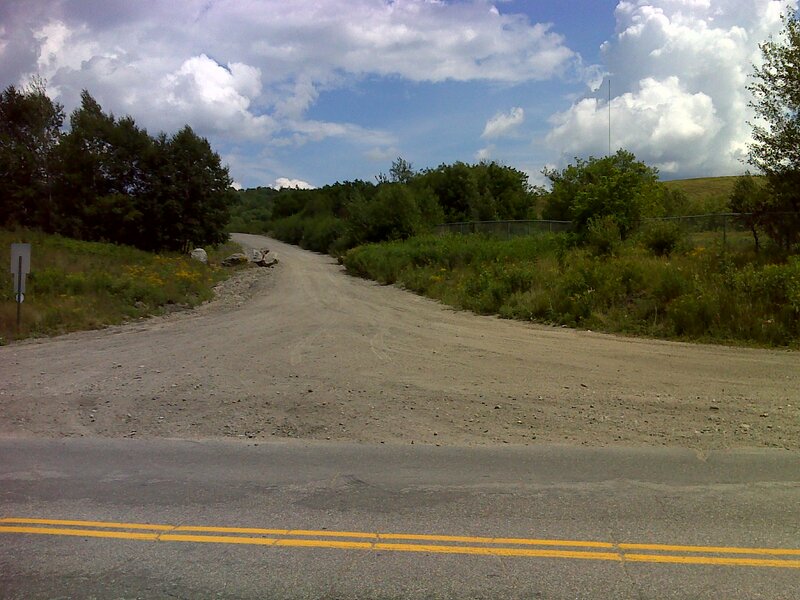 There are two speeds to drive Success Pond Road (because of the washboard conditions also known as 'corduroy road'). In order to avoid having every bolt in your vehicle come loose (not to mention all your teeth), you have to drive less than 15 miles per hour or more than 30. I tried both and was comfortable with either. The fast method requires about as much concentration as negotiating tricky, wet, side-sloped bedrock slabs on the local hiking trails. Your traction is always in doubt - but if you concentrate, you'll get through. If you're in no hurry, and don't want the adrenaline rush, take it slow. Okay ... now ... once you're on Success Pond Road all you need to do is follow the most well-traveled route. It's plain - the side roads are all much less used. At mile 5.4 you come to a standard white plastic AMC sign at a side road, and a standard green road sign saying "Success Trail Head". It's hard to miss. To get to the trailhead turn right on that road and then take the right fork at 0.15 miles and you'll come to a huge grassy parking area at the end of the road. The trail goes into the woods from the end of the parking area. If Success Trail isn't your bag, continue on Success Pond Road to Mile 8.1. 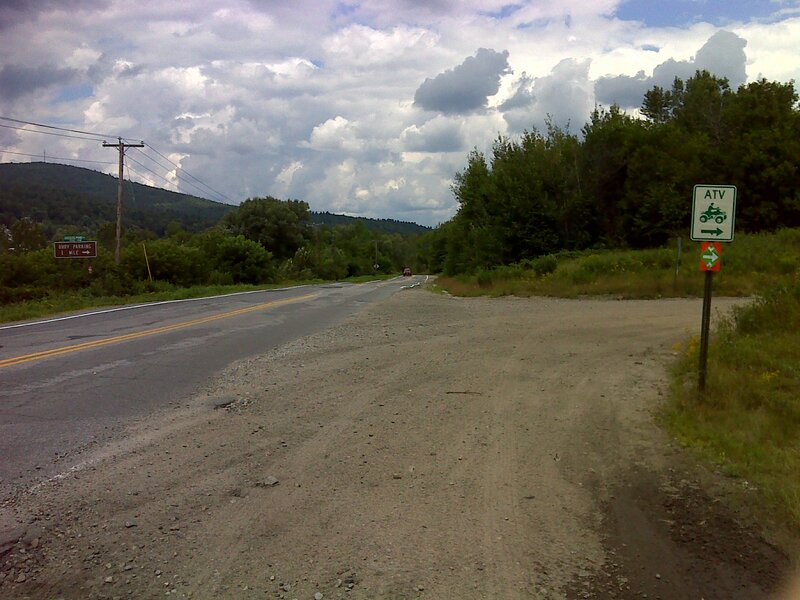 A white AMC trail sign for Carol Col trail and Goose Eye Trail is there on the right at a side road. It's getting a bit overgrown, but still not hard to see. On the side road there's a small parking area to the left, just 100 feet from Success Pond Road and visible from the road. Not interested in Carlo Col Trail? Continue on Success Pond Road to Mile 10.9. 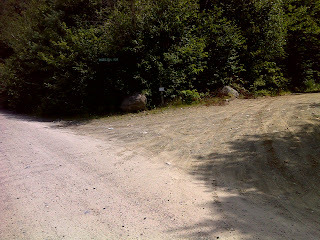 Another white AMC sign on the right at a side road introduces the Notch Trail (to Mahoosuc Notch), with parking 0.5 miles up this side road. Take this side road. You bear right at 0.3 miles and immediately cross a bridge with wide decking that looks like it's rotten. The underlying huge I-beams could hold a lumber truck, though, and the boards aren't all that rotted - yet. 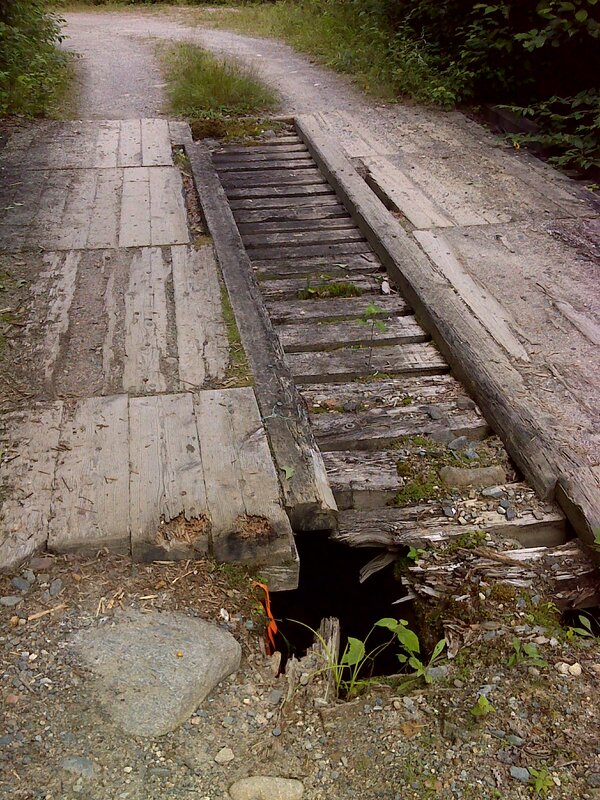 But there's a second bridge in worse condition with a hole in the center part of the decking. Again the basic structure is sound. The bridge isn't going to collapse under the weight of your vehicle. But stop and check the weak spot, then keep your wheels away from it as you cross, and you'll have no problem. Beyond is the trailhead parking area. There were three vehicles parked there on this Saturday. Mahoosuc Notch is a relatively popular spot. I can't wait for the day I get to do it both ways. But if you've no stomach for Mahoosuc Notch (or rotting bridge decks), there's one final trailhead. Drive to Mile 11.4 on Success Pond Road and take the right fork at a rock painted white with green lettering. It's hard to miss. This is the point where you actually take the slightly lesser traveled right fork. 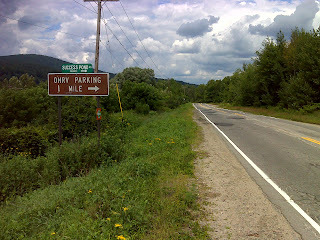 Go another 0.8 miles, crossing into the state of Maine, and you'll see a white AMC sign for Speck Pond Trail where the trail heads into the woods directly from the road. There's parking just beyond on the left. 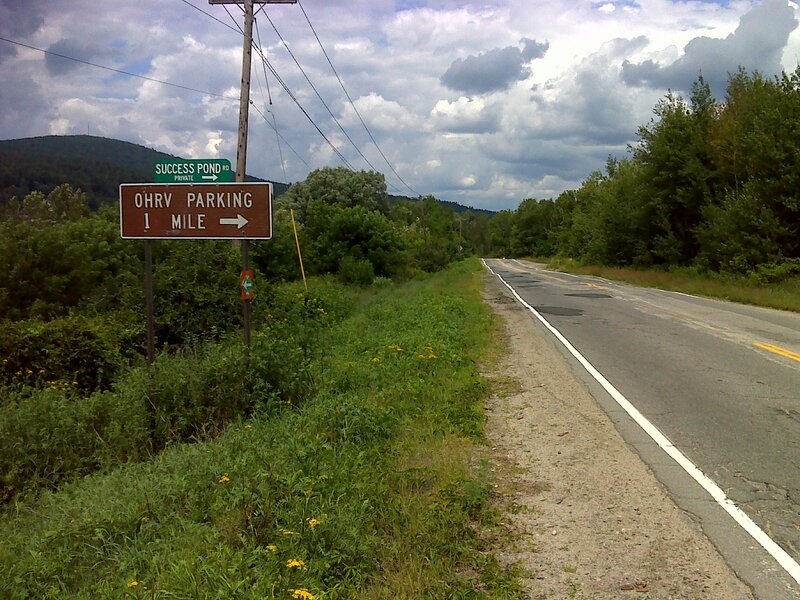 I did not go farther, but you can get to Grafton Notch and ME 26 by driving another ten or more miles. Success Pond Road itself was washed out by Irene somewhere on down that way, and it remains closed. You have to take the longer road called North Road. Again, I did not do this, and am just reporting what the AMC guidebook says. As for me, I drove back to Gorham, arriving just before 2PM. It had been nice and sunny (though warm and humid) all morning, but now the dark clouds were gathering. 2PM ... 'No way', I thought to myself. Yes way. It started raining just after 2PM. It poured. And then it stopped just before 3PM. WTF! Nobody can forecast the weather that accurately twelve hours in advance! And just to prove it, the rain came back at 4PM and was heavier than ever and continued unabated into the evening. And there had been no mention of rain after 4PM in the forecast. Whew! My 'faith' in the good old NWS and in the immutable fallibility of us 'trained' weather forecasters was restored. Up until now, every GPS track I've published has been a hiking track. Today I'm presenting the Success Pond Road driving track, complete with all the embedded photos I took. To see the photos, just click the title line.